One of the things that makes cancer so formidable—and so difficult to treat—is the fact that cancer cells literally refuse to die. In a healthy organism, abnormal cells are removed through a process of programmed cell death known as apoptosis. But in cancer cells, the apoptosis pathways are defective, allowing cancer cells to thrive and, often, making them resistant to conventional therapy. 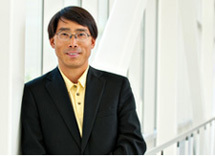 Targeting those defective pathways—and reinstating the process of apoptosis in cancer cells—has long been the research objective of Dr. Shaomeng Wang, U-M professor of medicine, pharmacology, and medicinal chemistry and Warner-Lambert/Parke-Davis Professor in Medicine. Thanks to the entrepreneurship of Wang and his colleagues, promising new anti-cancer treatments may soon find their way into clinical settings. From the beginning, interest among venture capitalists was strong, and, to date, Ascenta has accumulated $100 million in three rounds of funding. The start-up has advanced an orally active Bcl-2 inhibitor (AT-101) and a potent and orally active IAP inhibitor (AT-406) into Phase II and I clinical developments, respectively. In June of this year, Ascenta signed a global development and research agreement with Sanofi-Aventis to develop HMD2 inhibitors for cancer treatment. The agreement could yield as much as $400 million in milestone payments and royalties, allowing the company to pursue additional anti-cancer therapeutics. And, as proof that success breeds success, Wang has launched a second start-up, Ascentage Pharma Group, to develop and market other innovative drugs discovered in his U-M lab. As of March 2010, Ascentage has completed its first round of financing. Wang has been working closely with both start-up companies and currently serves as the chief scientific advisor for Ascenta and the chief scientific officer for Ascentage.